Gisèle started at a very young age to develop an interest in art. Her parents encouraged her by enrolling her in a 4-year study course with Famous Artist School of Connecticut founded by Norman Rockwell for young talented people. In 1971 I received my Certificate while working in the advertising department of « The Enterprise Weekly Newspaper ». 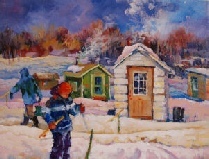 I joined the local art club and enrolled in more art classes at the South Porcupine College, Ontario. 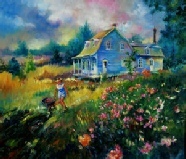 Motivated by her passion, family and friends, she participates to solo and group art shows, winning awards and mentions. 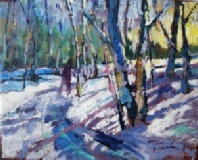 Spring 2006, Gisèle is invited to the « Symposium de Peinture de la Mauricie, at the « Centre des Arts, Shawinigan. 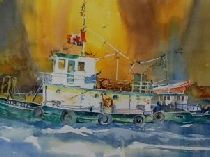 «Société Canadienne de L’Aquarelle » attribues Gisèle a second mention for her spontaneity for her art work.